For my daughters birthday this year we thought it would be great to skip the big birthday bash and instead opt for giving her a birthday experience. We bought a yearly pass to Disneyland and it has been the gift that keeps on giving for all of us. Her face lights up every time we go, and that makes our hearts happy. With the exception of a few food spots in Disney, we have been underwhelmed with eating there. As a result, we always eat before going, but reserve enough of our appetite and money to buy a sweet snack. 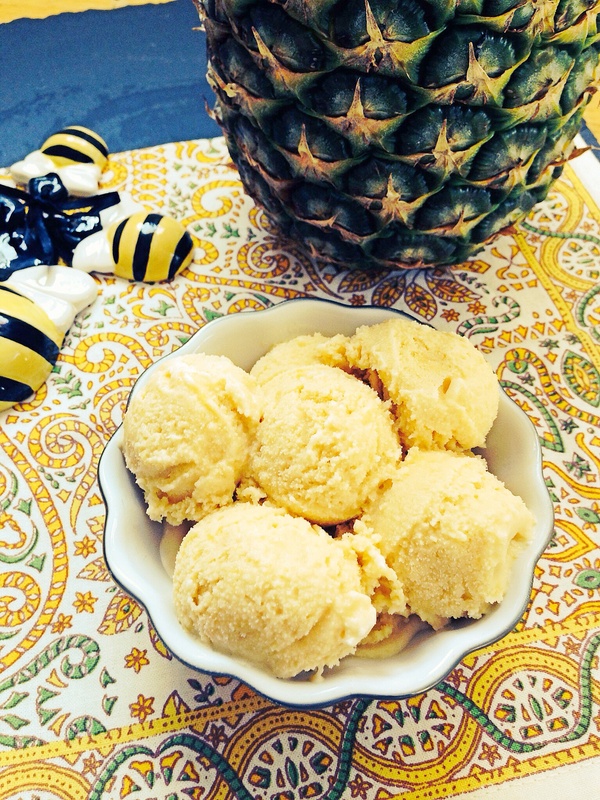 One of the great sweet snacks, besides fresh fruit, and Beignets, is pineapple whipped ice-cream! In order to get a cup you have to be willing to wait in a line equivalent to a line for waiting to get on a ride. The line is always long, at least 20-30 minutes long, but it is definitely worth the wait. My daughter is a lot like me, she loves the ice cream, but not the wait. I decided to try my hand at making my own version of Disneyland’s pineapple delight. 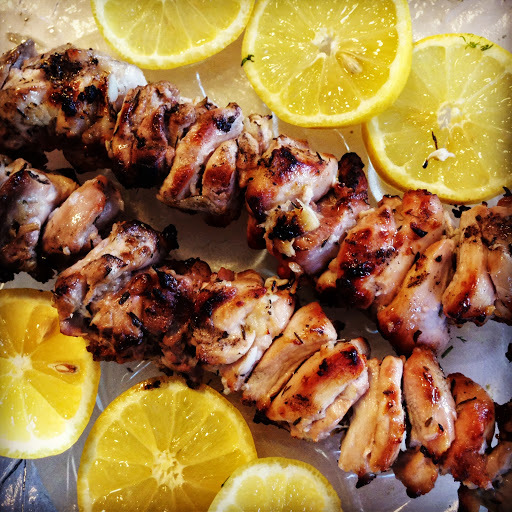 Let me tell you, this recipe has taught me a lot about enzymes and cream. My first go around with this recipe was a bitter experience. I mean that literally. The ice cream had this strongly bitter taste and I had no idea why. Aside from the bitterness the ice cream was delicious, so I set out to figure out why. It turns out that three things I did could have contributed to the bitterness. On the first test of this recipe, I created a custard, poured it into an aluminum bowl to cool, but added the pineapple immediately to the hot mixture. In my research as to why my custard turned bitter, I found that the enzymes in pineapple react with cream and create a bitter taste. Furthermore, the enzymes in pineapple, mixed with hot cream and left to sit in aluminum can also cause a bitter result. So the second time I made this, I poured my hot custard into a tempered glass bowl, let it cool to room temperature, and then added my pineapple. The result was perfectly creamy pineapple ice cream with not an ounce of bitterness. I should say that the bitterness in the first batch did dissolve with each day the ice cream stayed in the freezer, by the 4th day it wasn’t bitter at all. So in theory you could make it either way and have an bitter free experience, but who wants to wait 5 days to eat ice cream? Update: Cream reacts with the enzymes in the pineapple whether or not you use an aluminum bowl, so it’s best to cook the pineapple first before adding it to the cream. 1 1/4 cup of maple sugar, or sweetener of your choice you may need more or less depending on which sweetener you choose. In a medium bowl, beat together the yolks, and 1 cup of your sweetener of choice. You can beat by hand using a whisk, or use a hand mixer. Beat until thoroughly smooth and creamy. (A couple of minutes by hand.) If you’re using maple syrup, or agave, the mixture comes together quite quickly. Heat the milk, cream vanilla extract and the sea salt on low heat until just before it simmers. Remove from heat, then slowly whisk 1 cup of the hot cream mixture into the egg mixture to temper it. Return the still warm cream mixture to low heat and slowly whisk in the tempered egg mixture, until well combine. Stir with a wooden spoon until the mixture becomes thick enough to coat the back of a wooden spoon, then poor into a tempered glass bowl, or a plastic BPA free bowl. Allow to cool to room temperature. Add crushed pineapple to a sauce pan with 1/4 cup of maple syrup and allow to cook just until mixture starts to caramelize, remove from heat, allow to cool to room temp, then add it to the cooked cream mixture. You can process this in your I cream maker right away, or cover it and refrigerate it overnight to allow the flavors to meld, as I did. If you don’t own an ice cream maker you can still make this, by placing 1 cup of your cooled mixture into the 1 quart sized zip lock bag and seal it. It is very important that the cream mixture is cold when using this method, so try to let it cool for at least 3 hours before trying this method. Next pour the ice and salt into the 1 gallon ziplock bag. Place the bag with the cream mixture into the bag with ice and salt and seal. Make sure neither bag has any excess air. Now here comes the work. Shake the bag until the mixture becomes solid, at least 5-10 minutes, serve and enjoy! This entry was posted in dinner, Food, Food blog, gluten free, Healthy Whole Food Blog, low calorie, low carb, paleo, quick fix meals, recipes and tagged dessert recipes, Disneyland pineapple I cream, gluten free, Homemade ice cream, Ice cream, Paleo, primal, recipe. Bookmark the permalink.